Relatives of Pvt. 1st Class Herbert Pililaau, who won the Medal of Honor in Korea, visit the USNS Pililaau, named after him. 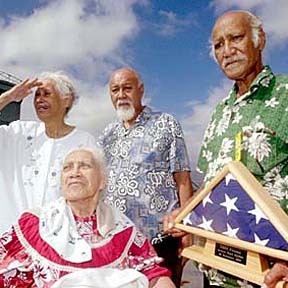 Brother Edward Pililaau, right, holds the ship's ensign, which was presented to him and his family. Next to him is brother Bobby Paaluhi, and in the wheelchair in white is his sister Agnes Nani Kim. Standing at left is Mercy Garcia, sister.